My Crossroads: :WS - They Love Music! :WS - They Love Music! 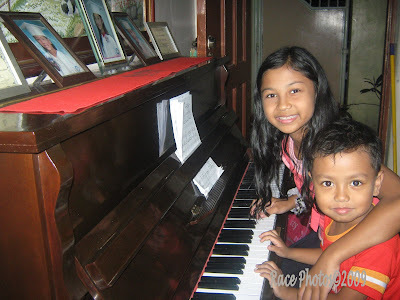 Everytime my kids visit my big brother's house they always sit on the piano and play as if they know how to play it. Here's Ruth and Josh posing for me to have them pictured at the piano. They love it. 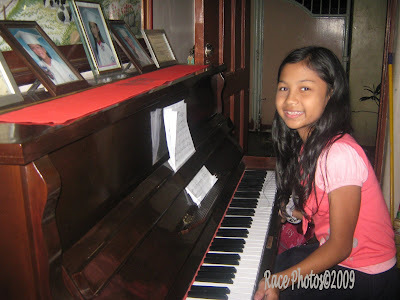 This piano was my father's piano way back 1945 which kuya restored and have it tuned to perfect condition. His three children are studying piano and they're very keen on playing it especially my eldest nephew Raph who knows at least 5 musical instruments. It's in my mom's blood and our children inherited that flair for music. My grandpa used to play alpha and some instruments on his prime. See other weekend snapshots here! Looks like their love for music runs in the blood. Good for you! It's also fascinating that the piano has a lot of history in it. Ganda. What a treasurer! Hope your kids will grow up to be fine musicians.